Perhaps to salve the disappointment of the SDCC exclusive not being revealed (and there are some out there theories regarding that figure springing up around the Web), Mattel dumped some serious surprises on us at the Gallery 1988 affair last night, including a look at the very first New Adventures figure in Masters of the Universe Classics: Optikk! The best pics can be found at ActionFigureInsider. I’m going to risk their wrath by re-posting a couple here, but you’ll have to visit their site for the full, hi-res images. Optikk, in my opinion, looks fantastic. I speculated back in October that Optikk’s addition to MOTUC was imminent, and I was 75% right in my guesses for how he would be put together. He has my predicted new armor and head and Kronis’s arms, but his legs are entirely Trap Jaw’s, while his crotch very obviously belongs to the future Man-E-Faces (though it’s still quite accurate to Optikk himself). 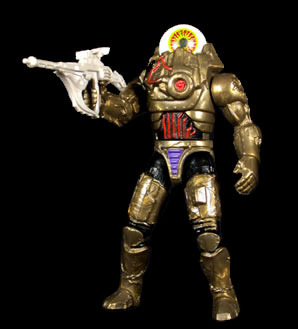 He also gets his distinctive gun, plus a brand-new shield and what appears to be an alternate head. No word yet on whether the head will be an interchangeable one included in the package or a production variant a la He-Ro’s staff jewel. Optikk was easily my favorite New Adventures figure–by which I mean, he was the only NA figure I owned, and I didn’t actually use him to play with He-Man but rather my other action figures, like the Ninja Turtles or X-Men. But I’m still very psyched by this news. I think he looks great, and melds just fine with the rest of MOTUC. But I realize a good number of fans are bummed about the prospect of having an NA figure foisted on them by the subscription. By the way, just to confirm, Optikk is the May monthly figure. But Optikk wasn’t the only surprise at Gallery 1988. We also got a better look at Evil-Lyn–including her wand, as well as Screech, complete with armor and stand. I’m still annoyed about her armor, but I’ll admit she looks more appealing here than she did in ToyFare. I’ve got a question, though–what are the odds the crystal ball in her staff will actually be translucent on the production figure? Mattel also posted some clues to future figures. On the left is clearly She-Ra’s shield, followed by what is probably Keldor’s acid vial. The other shield and sword are a bit trickier. The yellow sword could belong to Thunder-Punch He-Man or New Adventures He-Man, though I’d rather get a newly-tooled Power Sword for NA He-Man. The best guesses for the shield that I’ve read is that it’s the redeco for the re-release King Grayskull, or possibly Vikor; or both the shield and sword could be part of the upcoming weapons pack. Speculate away! Personally, I’m rooting for Vikor. But wait, there’s still more! 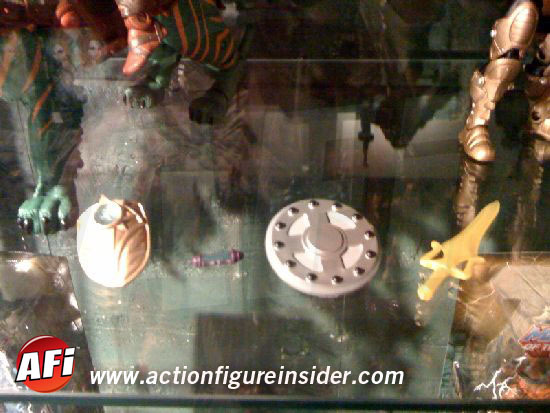 Mattycollector posted their catalog pages for Trap-Jaw, Wun-Dar, Battle Cat, and the MOTUC display stands. The Trap-Jaw pics are some of the best we’ve seen yet, and are making me both nostalgic and excited for the figure–much more than the 200X figure, awesome as it was, did. For some reason, for me it evokes the original ad for Trap-Jaw. All that said, I have to point out their catalog photo of Battle Cat. Saddle’s riding a bit low there, tiger. @Poe: I too thought there may have been some character shuffling going on, if only because Mattel's been sticking to their "good one month, evil the next" formula for a while now. Though I'm not as huge a fan of NA as I am the original I think Optikk looks amazing. Part of me wishes that he was a bonus figure instead of being part of the subscription but I also see the importance of staggering the releases so that 3 and 4 years down the line ( no pun intended ) we still have favorites to look forward to and not just a bunch of C-list or made up MOTU characters. I was beyond psyched to see Evil-Lyn again! I Love the option to have the wand or staff and think it was a really smart decision. 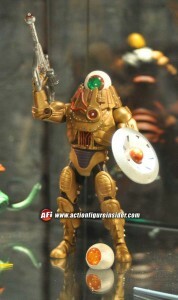 Screech looks awesome, though I feel a little sorry for Zoar not getting his own stand with the release of Teela. As for the orb, I didn't really doubt that it would be translucent in production until you asked the question… now I'm a lil' nervous LOL. I really hope it is though! My only question about her is whether there's a place on the figure to hold the dagger. Also, is it just me, or did Moss-Man look better too? Thanks for posting this today! I'm at work and of course being the weekend there is a dearth of news/activity online, plus the fact that 99.9% of all the sites I want to visit are blocked! They certainly did a great job wiht Optikk! I think at this point we can all pretty much envision what the figures will look like, but being that this was an NA figure, it was a little trickier. They are certainly going to get some good use out of those Kronis arms and Trap Jaw legs. Its a safe bet they'll be reusing them for Roboto and Man-E-Faces. I'm super excited about Keldor. It makes me feel slightly less bad that I never got the 200x incarnation. I wonder if he's bonus figure material or if he'll be released as subscription figure. I think I'm leaning towards subscription figure, since he'll require a new head sculpt (a mid accident acid burnt face would be awesome), plus a new cape. This would be a cool reason to bring int he 200x sword that Skeletor had in the MYP series, which was the original sword that the 4H designed, but the higher uppers had other plans in mind for it. Me again lol… this may be way out of left field but I've been looking at some of the original figures to try and place the shield. Stinkor came with a shield originally, but it was blue. I just thought maybe, with the black and white color scheme that it could be a possibility. I'm trying to think now, because not a lot of figures came with actual shields… so its got to be something significant. I’m no keaner, but I’ll say it again; These Four Horsemen chaps can do no wrong! @ Poe: Concerning the weapons – apparently, Toyguru claimed that She-Ra would not be packaged with a golden shield. And the He-Man sword will not be packaged with Thunder-Punch or Flying Fists He-Man. Keldor was confirmed, though. I could imagine that the golden shield might be part of the upcoming weapons-pack, with She-Ra sporting a silver version. The sword – as fans pointed out at the org already – might be a sign for an upcoming NA He-Man. If not, maybe it’s gonna be the sword of the King Grayskull Re-Release? I could imagine that the shield might be King Grayskull (II)’s. But Vikor would be a likely choice as well. I really like Optikk. I didn’t think that using the complete Trap Jaw legs would work so well on him. I’m not a fan of the eye colors and his shield though, and a second head is kinda pointless here IMO. Additionally, I remember Toyguru saying that the first NA character wouldn’t be who we expect. Well, did anybody NOT expect Optikk? The real speculation just began after Optikk seemed to be out of the way. Concerning Battle Cat, Mattel’s fotographers never fail to prove me that they couldn’t care less about doing pics right. @Reilly: That’s weird about She-Ra’s shield. Seems to me sticking such a unique distinctive item (as opposed to He-Man’s rather generic-looking shield) in a weapons pack would be useless, unless the idea with the weapons pack isn’t so much to give you extra weapons as it is to offer accessories they couldn’t afford to include with the figures themselves. As for Optikk being the first NA figure, who knows what happened there–maybe something had to get shuffled around, for some reason. does NO ONE take pics with something other than their cell phone anymore??? @Poe: It would be evil genius on Mattel's part to include an essential accessory in the weapons pack. If the weapons pack were simply stuff people already own, a bunch might skip it. But if it includes an item people NEED to complete a character, it would "force" tons of people to get it, who otherwise may not have. Evil genius. Optik is one of only 2 or 3 NA characters with a good design. Now he's going to be one of the top 2 or 3 MOTUC figures, IMO. This has been bugging me since I read Reilly's post earlier Saturday, but I hate posting. Oh well, here goes. I have a powerful fear based on the wording about She-Ra's shield. What if she is the other SDCC Ex and her shield comes poly-bagged ala Gleek? I figured we would get a weekend post with news like this hitting. Thanks for the link to better pictures, all I’ve seen so far were pretty blurry. Optik is amazing looking…although his head/ eyes seems a little small. Still one of the best MOTUC figures in my opinion. In the UK NA He-Man comics he had a gold version of the original sword….but I also liked the green sword the orginal figure came with. Mattel are really making some use of the the Power Sword mould. Would a re-release of King Greyskull not come with the 200X sword? @Thomas B: Haha… no kidding! I wonder if cameras were allowed in… how could they not be, this exhibit was by geeks for geeks, and news of it had to travel by internet! Even still, a simple point & shoot camera will take pictures than 99% of most camera phones. @dean: God help us all if you’re right! I can’t see them doing She-Ra as a SDCC exclusive, but leave it to them to have Orko, Kowl or Loki. @dean: Don’t worry too much:) Just remember that originally Faker and He-Ro were SDCC exclusives as well. 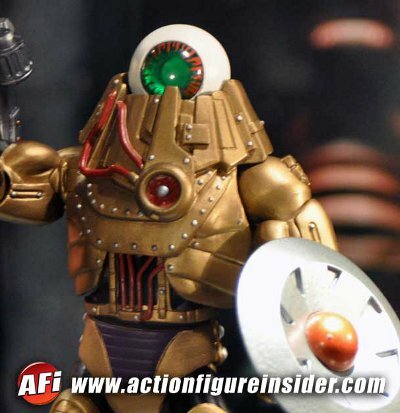 Not sure if mentioned before but, Molar the Eternian Dentist might be one of 2 SDCC exclusives this year. He's a character featured in a Robot Chicken parody. The other SDCC exclusive may in fact be She-Ra via a Matty Facebook post about "the Horde" and the delay in revealing it at the MOTU Art Show this past Friday. Great news from Mattel. Good stuff all around. 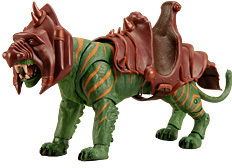 So, evil Matty's charging 20 dollars for Battle Cat, the same as for a regular figure. As an aside, I'm not exactly crazy about Evil Lyn's skin tone. @Andrew: Nope…$30. They just fixed it. I think $30 is a fair price for Battle Cat, but $20 would have been a deal in this day and age. i actually think they should use the SDCC exclusive to release figures that need alot of tooling since they can sell more of these figures AND charge 5 bucks more like they do with their con figures to help cover costs. There have always been exceptions to that "formula", including Faker/Mer-Man, Tri-Klops/Webstor, and King Randor/Adora.